Looking for smart seating solution without compromising on style? You have come to the right place. 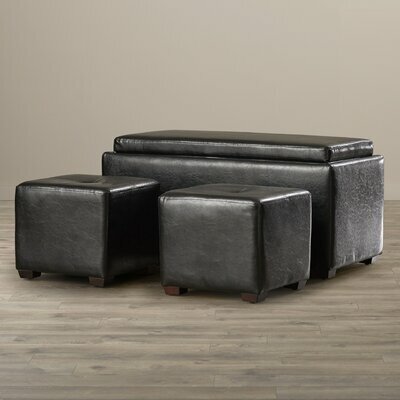 This rectangle ottoman collection is comfortable and sturdy for years of reliable seating services. Appealing colors and durable upholsteries will add a flare of style to your room décor. Ideal as additional seating space, these rectangle ottomans are perfect for bedroom, living room, entryway and other small rooms or spaces. 8. 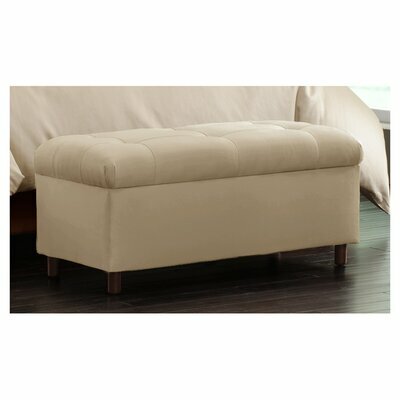 Leggett Drawer Ottoman by Darby Home Co. Perfect and practical addition to any home, the Double Storage Folding Ottoman promises comfortable seating and 1.5 cubic feet of storage space. It features robust and sturdy wooden frame that renders long lasting strength and durability to hold up to maximum 200 pounds of weight. It comes with a removable top that reveals ample storage space for keeping your less used items. Wrapped in soft and durable natural colored linen upholstery, this rectangular ottoman will accent an array of room decors. This ottoman provides comfortable seating and ample storage space. Wood frame is sturdy and robust. Polyurethane and foam filling for comfortable seating. Durable and easy-to-clean linen upholstery. Also available in faux leather upholstery and multiple colors. Natural, Camel and Espresso ottomans have linen upholstery while all others are wrapped in faux leather. 1.5 cubic feet storage space. Easy to carry and store; just fold it flat and it will occupy less space for quick mobility and storage. The Dorel Living Upholstered Storage Ottoman is a versatile and practical solution to your seating and storage problems. It features elegant black faux leather upholstery and lift-up top with foam padding for extra comfort. There is ample storage space below the lid where you can store your household accessories, magazines, books and more. 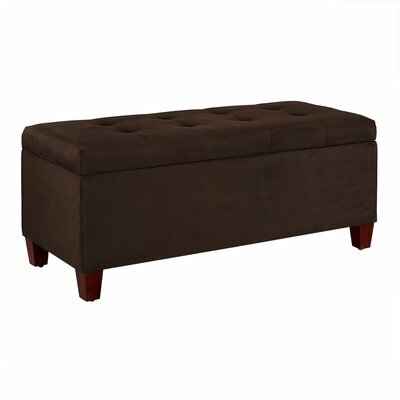 This elegant rectangular ottoman is perfect for sitting, resting your feet on and storing your items. When not in use, you can easily tuck it away. Versatile seating and storage solution. Sit comfortably or use it as a footrest. Frame and feet are crafted from sturdy wood. Durable and easy-to-maintain faux leather upholstery. Also comes in charming espresso color. Lift-up top is padded generously for comfortable seating. Maximum weight capacity: 150 pounds. 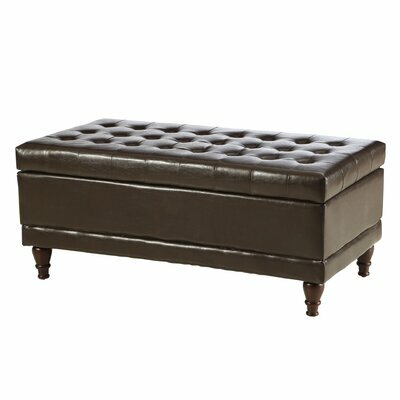 Luxurious and stylish, the Nelson Tufted Upholstered Microdenier Storage Ottoman is a practical addition to any room of your house. 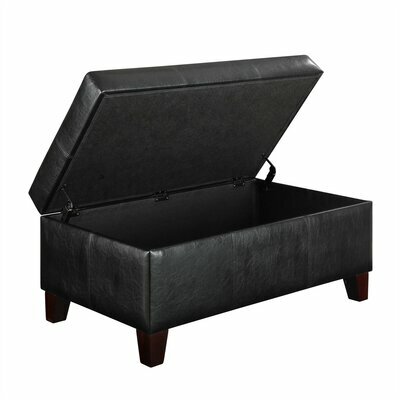 This unique and exquisite ottoman is handcrafted in USA so you can be assured about its quality and sturdiness. It features hidden storage space under the pull-off top where you can keep books and toys of your kids. The top of the ottoman is thickly padded and accented with tufts for a luxurious look. It comes in a wide range of appealing colors for you to select the one that suits your styling requirements. Strong and sturdy pine wood frame. Available in a wide range of appealing hues including azure, black, chocolate, khaki, kiwi, lazuli, oatmeal, purple, red, saddle and sage. Covered in 100% microdenier (100% polyester/polyester blend) upholstery. Lift-off lid with ample storage space. For comfortable seating, the seat cushion is lusciously filled with polyester and synthetic fiber. It is ready to use and does not require assembly. This ottoman is ISTA 3A certified for damage-free transit. 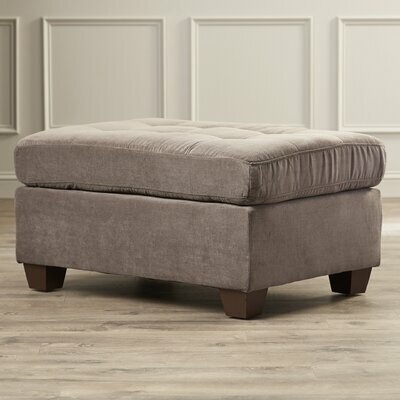 The Charlton Home Alfraye Storage Ottoman is an ideal seating and storage solution for any room of your house including bedroom, living room or entryway. You can also place it in your walk-in closet. Upholstered beautifully in red microfiber upholstery, this ottoman is a visual delight to the eyes. The subtle tufting details on the top accentuate its overall look. Sit comfortably in style on top cushion that is generously padded for additional comfort. Lift off the lid to reveal ample storage space comprised of two side pockets and one open compartment in between. You can store practically anything in this ottoman. Frame is constructed from manufactured wood. Covered in durable microfiber upholstery. Plush cushion top with thick padding for comfortable seating. Hidden storage space under the hinged-lid. Side pockets inside the ottoman provide ample space for storing shoes. This ottoman can also be utilized without legs. 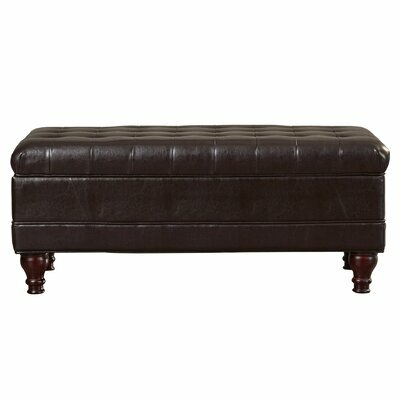 Classy with luxurious design, the Amhearst Ottoman by Three Posts is a must-have in your home. It showcases rich brown faux leather upholstery further adorned with deep button tufts and elegant turned legs. Enhance the grace of your bedroom by placing this ottoman at the foot of your bed. You can also use it as an additional seating next to coffee table in your living room. Internal storage space beneath the lid allows you to keep your room clutter-free. Distressed look for a classy touch. Storage space beneath the lid. Rests on gorgeous turned feet. Maximum weight limit: 150 pounds. The cozy and plush Aedesia Cocktail Ottoman is an ideal seating solution. This contemporary ottoman features plush and thick cushion for a comfortable seating and strong wooden frame that enhances its durability and sturdiness. It has rectangular shape with thickly padded seat cushion and soft-to-touch suede upholstery for relaxing and pleasurable seating experience. Wooden frame construction renders strength and reliability to the ottoman. Covered in handmade suede upholstery that is soft and plush. Also available in chocolate and truffle colors. Seat cushion is lusciously filled with foam and synthetic fiber. Removable wooden legs in block style. Requires minimal assembly; no tools required for assembly. Manufacturer provides 180 days limited warranty. Elegant and stylish, the Andover Mills 3-Piece Storage Bench & Ottoman Set is a smart choice for small rooms and where space is less. This dual purpose bench and two ottomans set is very practical. The bench features thick cushion for comfortable seating with reversible top and wooden serving tray. This versatile bench can also be used as a coffee table or center table in your living room. The set includes two matching ottomans that serve as extra seating for guests and kids. One storage bench and two small ottomans. Both ottomans are square shaped. Ottomans are accented with single deep tuft detailing. Elegant black faux leather upholstery. The bench has ample storage space below the lid. Reversible top also serves as a wooden tray. No storage space available in both ottomans. Add stunning detail to your home with the lovely Darby Home Co. Leggett Drawer Ottoman. It features plush seat upholstered in dark brown faux leather and accented with deep tufts. It has a slide drawer below the seat cushion where you can store magazines or newspapers. This elegant and luxurious ottoman is an excellent choice as an additional seating space in any home. Robust and sturdy hardwood frame. The seat is wrapped in durable faux leather. Accented with elegant tufting details. Dark stained legs in tapered style. Enhance the elegance of your home with the stylish and luxurious look of Hathaway Ottoman. 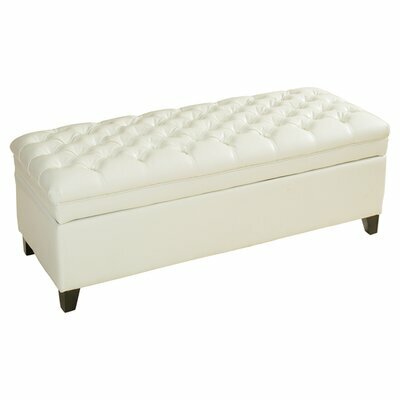 Featuring radiant white faux leather upholstery, this ottoman will add a stunning detail to your room. 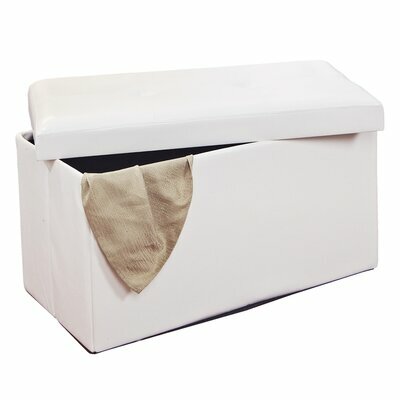 There is an under-the-lid storage compartment where you can keep and organize your items for a clutter-free household. Frame is built from solid wood. Bonded leather upholstery looks and feels just like real leather. Also comes in espresso color. Seat cushion is adorned with tuft detailing. Spacious storage space for stacking your items neatly. The aesthetically appealing Bowyar Storage Ottoman is an excellent choice for you if you are looking for style, elegance and comfort in one package. It features luxurious style with rich looking faux leather upholstery and elegant turned legs in gorgeous dark wood finish. 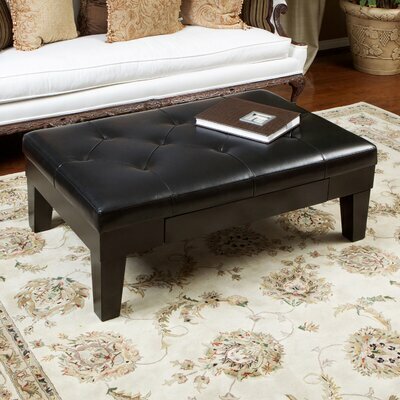 Upgrade the look of your room with this stunning and classy ottoman. Faux leather upholstery features vinyl fabric. Embellished with tufts and neat tailoring details. Elegant and classy turned legs in dark wood finish.